Oh yeah, just when you thought hair curling tools can't get any better, think again! A vertical curler is the new in thing and after trying it myself, I'm hooked. Not that I'm any good with a conventional curling iron, in fact, I really dislike curling my own hair because it takes too long, my arms gets very tired, the curls doesn't seem to last on my hair, and I'm just bad at it in general. 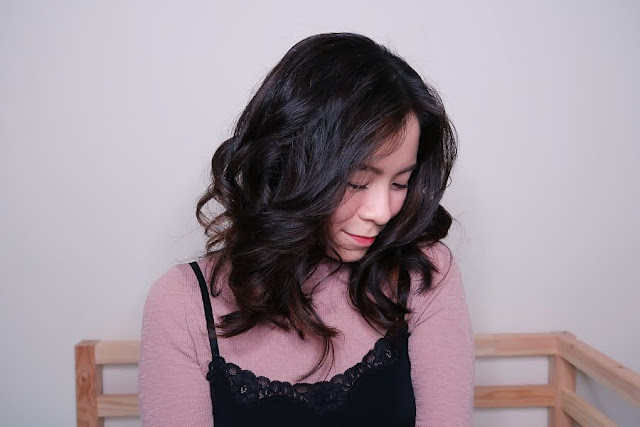 Due to all these factors, as much as I love having curly and wavy hair, I kept it plain to avoid the hassle and the frustration. But this new tool changes everything! 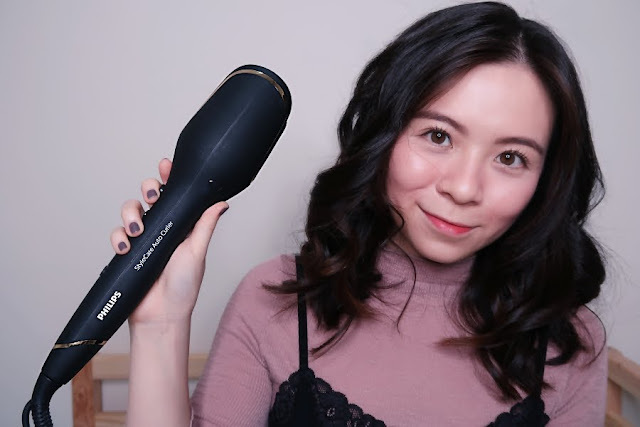 Philips launched the StyleCare Prestige Auto Curler recently and it quickly became my dream curling wand because it was just so easy to use. Curling in reality became effortless thanks to its innovative smart curling system. Watch the video below to see how it works on my hair! Each Auto Curler comes with 2 accessories, a sectioning tool that I personally don't think I'll ever use, and a barrel cleaner. The Auto Curler has a similar sleek design as the Philips Easy Natural Curler that I reviewed two years ago with a tulip shaped exterior. The vertical grip really makes a lot of difference as it makes it so much more comfortable for my arms. I don't need to hang my arms in the air too much any more just to get the curls especially the strands at the back of my head. Operating button is also placed in a easy to reach position. Besides the vertical grip, this too, the two auto-rotating smart curl guards, is a huge contributing factor to an easy home hair curling session. It allows hair to perfectly and evenly wrap around the barrel at a controlled temperature. The good sized barrel and the open design of this tool follows that natural flow of your hair and helps to style your hair with very little effort. Personally, so far, I do not have issues with it getting completely stuck with my hair. If I felt like it's not curling properly, I'll just remove my finger from the button and it releases my hair easily without hassle. They claim to have 113% more curling surface and is able to style 2 times more hair in one go. 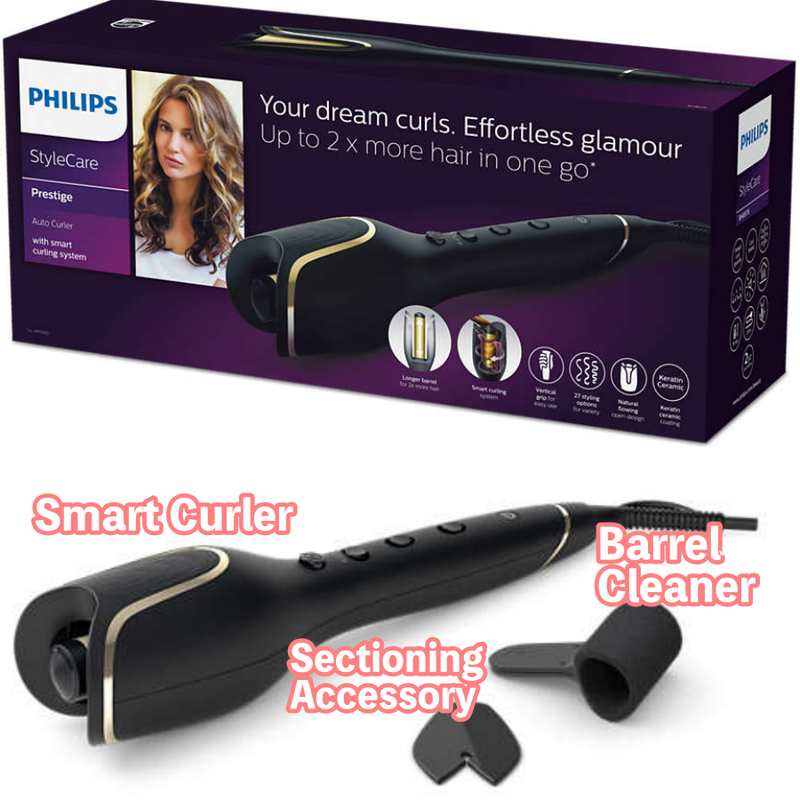 This is just a comparison to their previous version, the Philips ProCare Auto Curler HPS940/03 model. I didn't even know that curler existed because I don't remember them launching it in Malaysia. 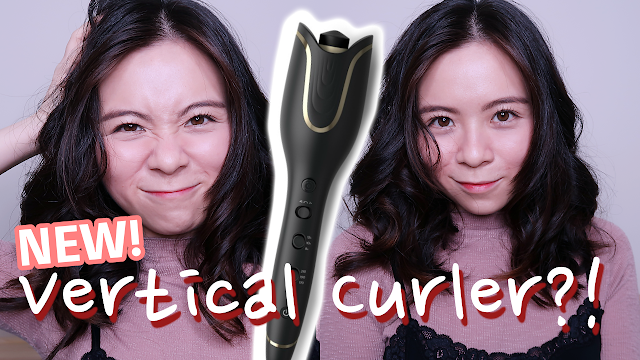 After watching a video of their previous, definitely yes, this new auto curler can definitely curl much more hair at one go. For me, when trying it out, I remember taking a few bigger chunks of hair at one go and still works well. Besides that, the barrel is coated in protective ceramic coating that's infused with keratin, which makes it better for our hair. 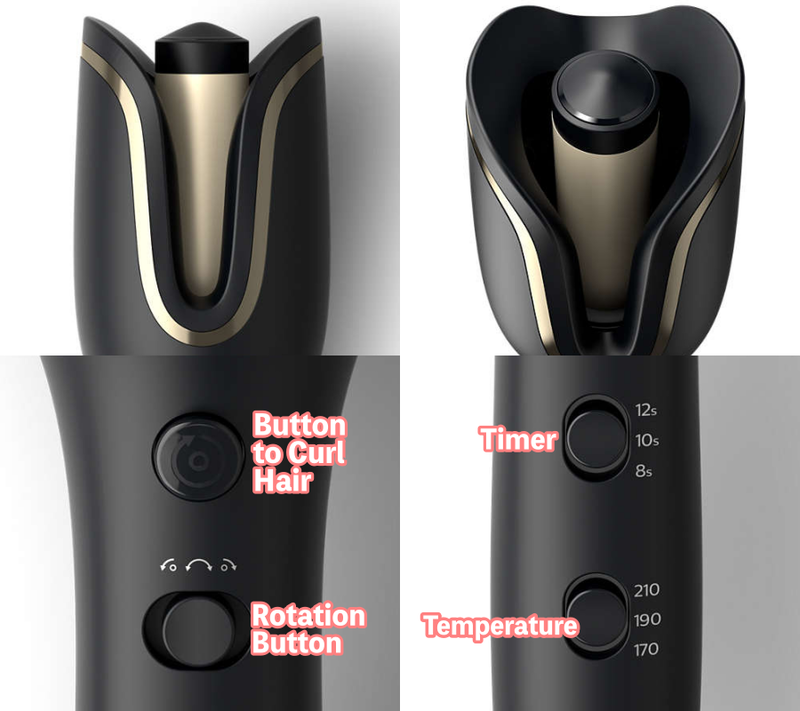 I really like that they have 3 temperature settings, 3 timer settings, and 3 rotation choices, because different hair have different needs, some hair needs a higher temperature to get a proper lasting curl. Additionally, this gives us more styling options, I can do different curling styles, from super tight curls to a more Victoria Secret bombshell wave. The rotation choices allows an amateur like me to let it go random or great for people who wants more control with the other 2 adjustable curling directions. With a traditional curling iron, you'll never really know if it's already 10seconds or not. With the StyleCare Prestige Auto Curler, it will tell you when your curl is ready by giving continuous beeping signals. This protects you from overheating your hair! If in an odd chance you got your hair tangled, it has a auto stop feature that turns off the power of the curler automatically to protect your hair in the chamber. Personally, I've not experienced any tangles yet, thus I can't really vouch for this yet. This is quite a huge deal for me. I realise while curling my hair, I can get the tool as close to my ears and face as I want without getting burn. The exterior is cool to touch! No more burned fingers or ears or face! Overall, I really do highly recommend it to anyone who wants to be able to curl their hair easily and comfortably. Truly, this tool is a game changer for my hair. I don't have to think twice anymore if I wake up one day and wanted some beautiful curls. Thanks to its ease of use, I can have dream curls any day now! I'm SO HAPPY! :D Thank you Philips for this amazing product! 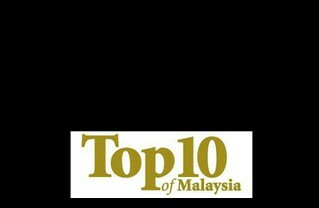 For more information, feel free to visit the Philips Malaysia website. The suggested retail price is RM629.00.